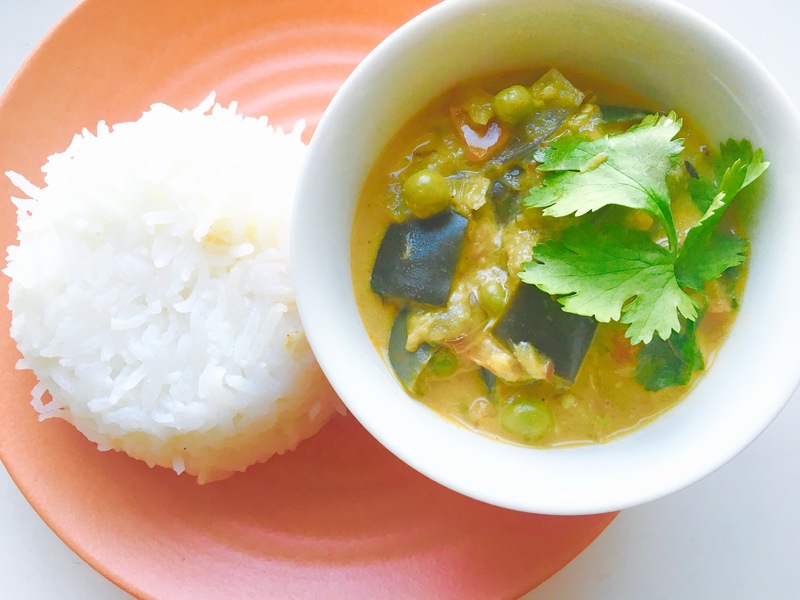 Love coconut curries? Here’s another to add to your list of curry recipes! Start by rinsing and chopping the aubergine. A quick note here, chop them to smaller than bit sized pieces and immediately soak in a bowl of water as you chop – this will avoid them turning brown from the exposure to air once cut, they also tend to turn bitter if this step is skipped so please follow! Then add the aubergine, peas & sprinkle in some more salt and on a low heat cook with lid on for 10mins or until they are cooked through, occasionally stir to avoid burning. Once the aubergine is cooked through and soft, add the coconut milk and stir, allow to cook for another a minute. Do a taste check. Lastly, add the chopped coriander and you’re done! Looks great! I’m a huge fan of aubergine, but I don’t think I’ve had it in curry before. Will have to try it in this, and maybe sub the peas for chickpeas too.